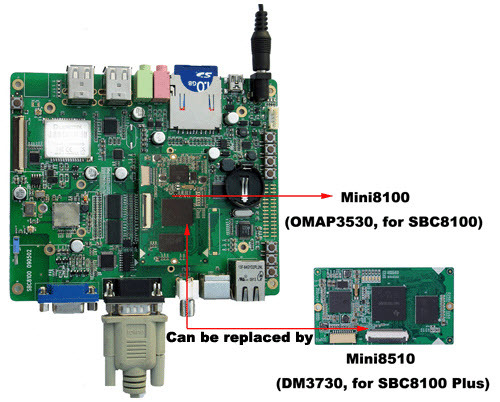 SBC8100 Plus is now available with DM3730 CPU board Mini8510! Mini8510 hardware fully compatible with Mini8100! Migrate from the OMAP3530 to DM3730! Embest SBC8100 Single Board Computer is a high-performance controller board based on Texas Instruments' OMAP3530 microprocessor introduced by Embest after Devkit8000 evaluation board. It is designed based on the Mini8100 CPU board which integrates an OMAP3530 microcontroller, 256MByte DDR SDRAM, 512MByte Nand Flash, RTC, LEDs and one Camera interface on board. The Mini8100 is connected with SBC8100 expansion board through two 1.27mm space 2*45-pin dip connectors. The SBC8100 Plus integrates Mini8510 as the CPU board which compatible with Mini8100 but using TI's DM3730 as its CPU core board. This is convenient for customers who used SBC8100 or Mini8100 before to upgrade to SBC8100 Plus or Mini8510 so as to migrate from the OMAP3530 to DM3730 for their embedded designs. In addition to those features provided by the CPU board, the expansion board has exposed many of other features of the OMAP3530 or DM3730. It has integrated RS232, USB, Ethernet, WiFi/Bluetooth, GPS, Audio In/Out, Keyboard, LCD, VGA, S-Video/TV out, SD card and more other functions on board. So many hardware resources provided by the expansion board, it becomes a solid reference board for customer design. Embest also offers a complete software development package to customers. The board supports linux 2.6 and WindowsCE 6.0 operating systems and is provided with complete basic drivers which enable a quick channel to evaluate the TI OMAP3530 or DM3730 processor and customize application software. It would be an ideal development platform for multimedia and communication applications.